©2000 Meg Zimbeck. Some rights reserved under the Creative Commons License. Welcome to Belleville – home to one of Paris’s lively Chinatowns, a burgeoning artist quarter and a dizzying array of cultures. Belleville has always been a working class neighborhood, with immigration generating much of the area's zest. What started in the 1920's with Greeks, Jews and Armenians led to waves of North Africans, Sub-Saharan Africans and Chinese immigrants settling here. Cheap rents have also led artists to flow into the area, making it an ideal spot for their ateliers. Belleville may not provide a typical experience of Paris, but its energy and diversity are certainly worth checking out. While not huge, Belleville is sandwiched within four Paris arrondissements (districts) – the 10th, 11th, 19th and 20th. It lies to the east of the Republique metro station, to the southeast of the Bassin de la Villette and the Parc des Buttes Chaumont, and north of the Pere Lachaise cemetery. Belleville is best served by metro line 11. Get off at the Belleville station to land directly in Chinatown, or walk towards it from Couronnes station (line 2). There is no metro stop for the Parc de Belleville, so your best bet is to get off at either Pyrénées (line 11) or Couronnes and weave through the side streets. Stations Jourdain and Telegraphe (line 11) will deposit you in the northern reaches of the Belleville neighborhood. Belleville was a wine-making village, independent from Paris, until 1860 when it was annexed into the city. It was especially popular for its guinguettes, or country cafes. 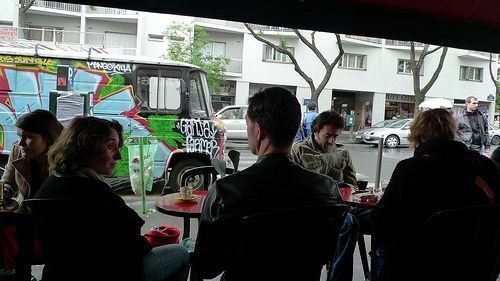 A tradition of folk music is also strong in the area, and up until very recently residents of the area were said to speak with their own specific Parisian accents and linguistic vernacular. Residents of Belleville were considered some of the most rebellious, resisting fiercely during the Paris Commune of 1871, a popular insurrection that ended when the Versailles Army came to reconquer the city. The early 1900's saw many cultural groups fleeing persecution in their home countries and landing in Belleville’s safe haven: the Ottoman Armenians arrived in 1918, the Ottoman Greeks in 1920, the German Jews in 1938 and the Spanish in 1938. Tunisian Jews and Muslim Algerians began arriving in the 1960's. The area remains one of the city's most diverse-- not to mention artistically vibrant. Parc de Belleville : Leave the chaotic urban bustle behind and enter this unassuming sanctuary. The Parc de Belleville offers strolls through tree-covered lanes, cozy park benches and a magnificent 180-degree view of the city. You may also want to venture a little further north to see the far larger Romantic-style park known as the Buttes-Chaumont. Edith Piaf’s birthplace: The legendary singer is said to have been born under a streetlamp on neighborhood thoroughfare rue de Belleville. There's a commemorative plaque at number 72. You can also visit a statue nearby depicting and paying tribute to Piaf. Tucked away just off the main, busy stretch of Boulevard de la Villette is Place Sainte Marthe, a tranquil and sunny corner of Paris with an old Mediterranean vibe. Stop by Le Sainte Marthe restaurant for a combination of old Parisian bistro and Spanish tapas bar. And make sure to save room for the moelleux au chocolat for dessert. Attracting a mixed crowd, this bar-- featuring somewhat garish, flourescently lit interiors-- is much loved by Belleville residents, so much so that it has featured in four films. Food is not served here, but the beer is always on tap, and inexpensive. The large outside terrace is always full, especially on evenings and weekends. One of Belleville's consummate hipster and student hangouts, this bar, splashed in red decor, offers inexpensive drinks, free wi-fi, music and open mic poetry nights featuring some of the city's edgier DJs. Belleville hosts too many well reputed Chinese, Vietnamese, or Thai kitchens to count. Duck into one of the area's many Chinese or Vietnamese restaurants on Rue de Belleville or Boulevard de la Villette. If you’re longing for a taste of home, get your fix here. Every other Monday, this trendy nightspot offers poetry slams in English, where anyone is free to sign up. If that’s not your thing, come for one of their other eclectic events, like Tarot card readings or acoustic Blues jam sessions. There are several starting points for checking out Belleville's many art galleries – like Place Sainte Marthe and Rue Dénoyez – but if you’re feeling overwhelmed by all the choices, head over to the AAB. This association represents more than 240 neighborhood artists and has its own gallery, showing the collective’s various works. It also organizes the Belleville Portes Ouvertes d'Ateliers d'Artistes (Open House day) in May, when local artists open their studios to the public.